We are pleased to announce "7th International conference on Pharmaceutical Auditing ", scheduled from June 08 - 09, 2018 in Baltimore, USA. Event Date : June 08 - 09, 2018 . 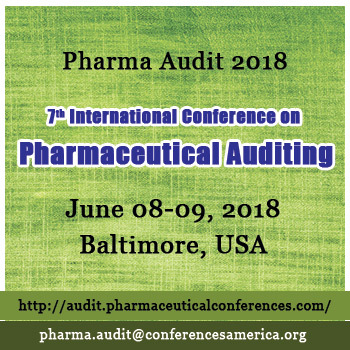 I am pleased to invite you to our inaugural 7th International Conference on Pharmaceutical Auditing which is slated to hold from June 08-09, 2018, in Baltimore, USA. Pharma Audit 2018 firms in the world to bring together the best brains for talks on the GMP,cGMP, and Regulatory Affairs.We would be delighted to have you at this conference to hear(or) present your talk and share about your research.